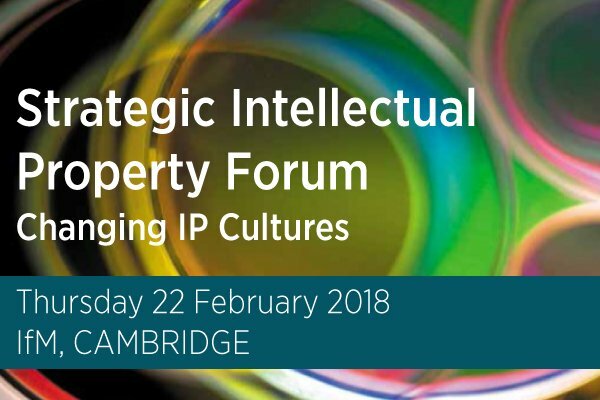 Avidity IP are proud to sponsor the sixth Strategic Intellectual Property Forum event with Cambridge University, Institute for Manufacturing to be held on 22 February 2018. The title for this Forum is “Changing IP cultures” with speakers from an engineering conglomerate-ThyssenKrupp, Big Pharma – AstraZeneca, Artemis Racing and Williams Technology ventures Limited. Intellectual property (IP) may adopt many forms – patents, trademarks, goodwill, designs, copyright and know-how. But what all of these forms have in common is that they provide key IP assets potentially with substantial commercial and innovation potential. Knowing how to leverage these IP assets requires a balanced blend of IP awareness, commercial understanding and familiarity with IP portfolio management. Committed to supporting UK industry, IfM’s Centre for Technology Management (CTM) and Avidity IP launched the Strategic Intellectual Property Forum (SIPF) several years ago to help companies understand how to manage and exploit their IP.